I'm back! It's been awhile, hasn't it?! 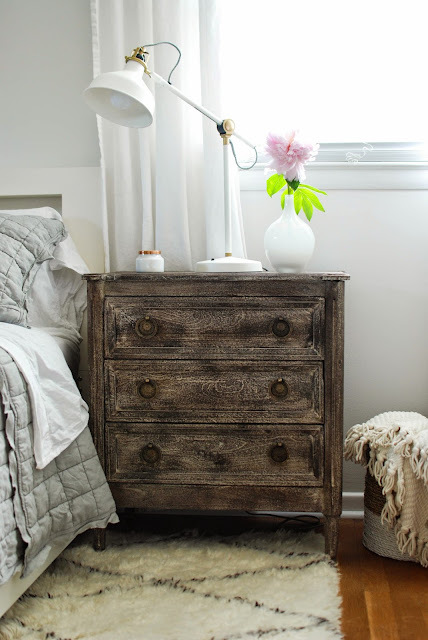 Today I have our master bedroom makeover to share with you. But first, a few weeks ago, I was cleaning out stuff for a garage sale and ended up rearranging a few things. I took down my faux fireplace and brought my parsons desk upstairs to put in it's place. It's a fun change for now. I enjoy switching things up every once in a while and I have a nice place to sit and blog. But I'm holding on to the faux fireplace because I may want to put it back up in the Fall. You just never know! It wasn't awful, but it wasn't cozy or inviting to me either. I never walked into our bedroom and loved it. 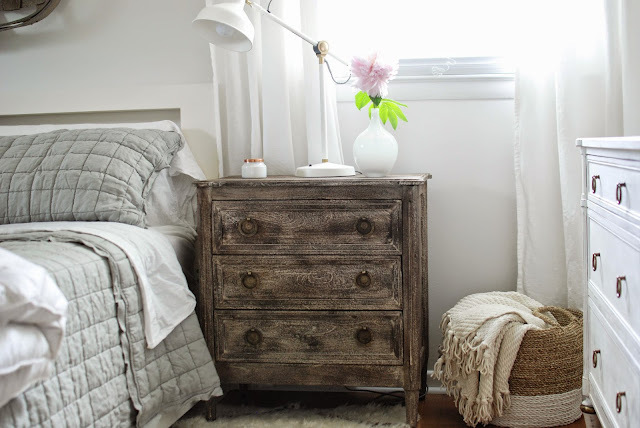 It had become a mix of things we had on hand and some random things I'd bought because we needed something immediately and didn't have time to find what we really wanted (like the nightstands that I found cheap on craigslist). We hated the rug because it was constantly slipping around and bunching up, making it a tripping hazard. After several bad experiences buying cheaper types of rugs, we've learned not to skimp on them anymore. A good quality rug really is worth the extra money. So one day back in April, a rug that I had been eyeing for months on rugsusa went on a huge 75% off sale. 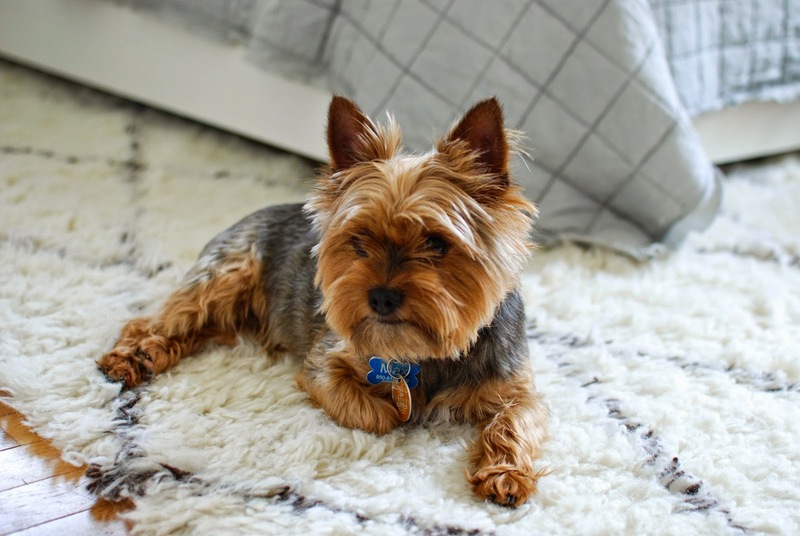 Without the sale, the rug is way out of our price range, but with the amazing sale, we decided it was too good of a deal to pass up. And that one purchase was the inspiration that led to the complete re-doing of the entire room. As I was waiting for my rug to arrive, I decided to re-paint the walls. They were a darker gray than I really wanted and it had been bugging me for quite some time. 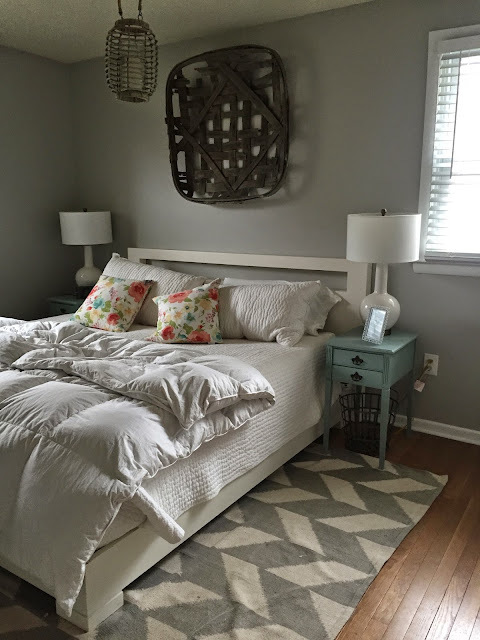 I felt like the dark gray walls were hindering me from making the room into something I loved. And I figured that it would be best to re-paint the room before the rug arrived. The walls are still gray, but they're a much lighter gray now. I also took everything out of our room that I didn't love - which pretty much was everything except the bed, our dresser, and the tobacco basket hanging above our bed (which I had removed in order to paint). After that, the room was barebones, but it allowed me to envision what I wanted it to become. I was really drawn to neutral cozy spaces on Pinterest. 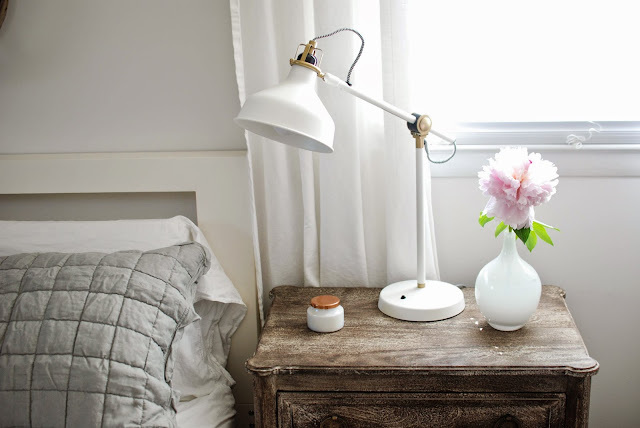 I liked simple rooms with natural elements that were almost minimalist. They seemed so relaxing to me. The Nester has coined a phrase called the "cozy minimalist" and I've decided that's exactly what I am. I don't like a ton of stuff, but I love a room that feels cozy with layers and textures, a plant or two, a candle, and just a few meaningful pictures. I don't like clutter. So with that in mind, I went on the hunt for finding and adding in only the things I loved. And in the end, I have a room that I love. The nightstands were the absolute hardest things for me to find. We have a pretty tiny room and finding two that would fit was challenging. Plus I had a pretty good idea in my mind what I wanted… I just couldn't find them. 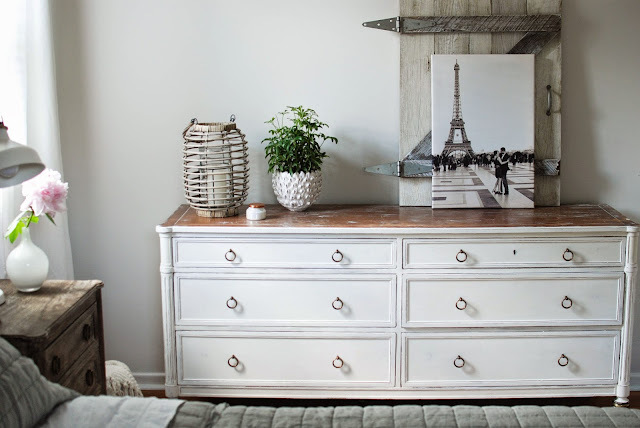 I wanted something a little bit rustic looking, washed wood, with drawers (not shelves), and I wanted them to have simple lines and a similar style as our dresser. When I stumbled upon these from Anthropologie, it was love at first sight. They are the exact same shape as our dresser; from the rounded edges, to the feet, the simple drawer faces, and even the ring drawer pulls. Perfection. They go well together, but they aren't matchy matchy. And they weren't too big for our room either! Remember the dresser I found on the side of the road in my neighborhood and gave a makeover? This was another place where we saved a bunch of money by not buying something new. It's one of my absolute favorite furniture finds ever. It pays to be patient! I also wanted to make sure to put only a few favorite things on the top of the dresser to keep it feeling clutter-free. The canvas picture of Tim and I dancing in front of the Eiffel Tower last year is super special and reminds me of the amazing things God can and does pull off for us just because He loves us. The tobacco basket was something Tim and I bought in Tennessee several years ago. I got it for a steal at only $20, which is pretty much unheard of for a tobacco basket. And to think I almost walked away from it because I wasn't sure if I really loved it. Well, years later, it's still one of my favorites. 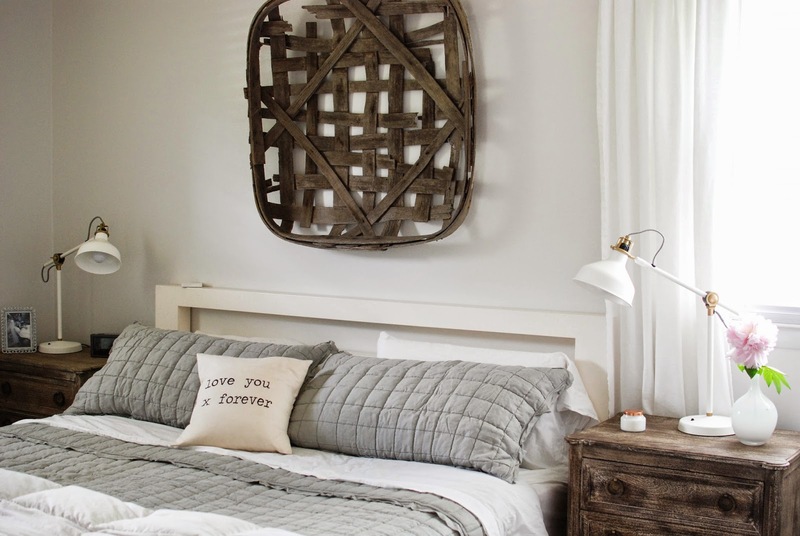 It's a piece that makes a great focal point over the bed, but because it is neutral and made of wood, it still feels simple and minimalist to me. And let's not forget the rug because it is amazing. It's 100% wool and it feels so soft and luxurious on my bare feet when I get out of bed in the morning. This is probably not a rug that I would put in a high traffic area with kids and dogs, but that's exactly why it feels so special to have it back in our master bedroom. It makes me feel spoiled, like we have a little retreat all to ourselves (except that kids and dogs still try to sneak in and lay on it :) ). Our room is so cozy to me now and I enjoy being in there. 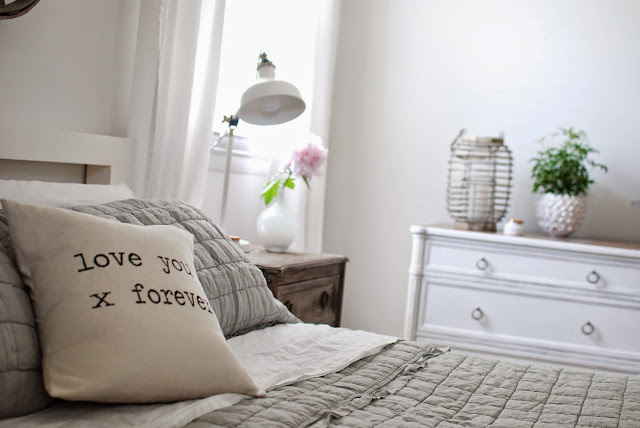 I think when you are intentional about only keeping the things that you love or find meaningful or useful in a room, then it pays off in the end with having a room that you love. Your room is so beautiful and peaceful - I love it.